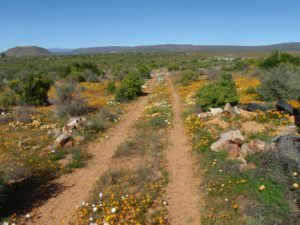 Oudrif is a fully catered lodge situated on the banks of the Doring River in the Northern Cederberg, providing stylish accommodation in 5 individual straw bale cottages. Winter rains bring the largest outdoor flower display in the world; the pristine river provides opportunity for paddling, swimming, fishing and sun bathing on secluded beaches. The area whispers of our past from Stone Age tools to San rock art. Our rates include – all meals, local beer and wine; and soft drinks served in the central boma, we lead daily guided walks and excursions. You just need to jump in your car with your clothes and toothbrush, we provide everything else. Early morning coffee and breakfast with freshly baked muffins, lunch fit for a River Queen and at night, a barbecue by moonlight at the boma, including, local wine, beer and soft drinks. Then, retreat to your unique straw bale cottage. Stylish and comfortable – from the crisp white linen and modern conveniences to eco-friendly solar power. Relax on your private veranda: perfect for stargazing and, perhaps, soul searching. Visit us; relax in splendid isolation. The idea of a remote getaway with accommodation for discerning guests who would appreciate the heritage of an untainted environment, germinated over a resplendent dinner table 16 years ago. This was very late in the evening. Fortunately, it was one idea that did not vanish like mist in the morning. The talk continued on and off until the land was found at Oudrif – an area that Bill knew intimately as a river guide and Paddy had visited on rafting trips over a number of years. The isolation of the area was its main attraction and of course the perennial river provided the life-giving potential that had always been the pulse of this valley. This isolation proved to have its own problems with setting up this project. Ronel was astounded when she was first introduced to the area. A “town person”, it was hard for her to see what could be done and how. In many ways Ronel has been used as a yard-stick to ensure that what we are offering satisfies the home comforts of those who are not orientated towards the rigours of roughing it. All in all, the project has taken four and a half years to complete. Many lessons have been learnt and much personal satisfaction has resulted from making the farm productive and by ensuring that we can share the abundant heritage of the area with like -minded guests for some time to come.